Picture the scene: it's the summer of 2008, and I'm in San Francisco. I'm wandering down the Castro and drop into a bookshop. Perusing the shelves I see a book that I simply have to buy. It is the above book. You might understand my excitement if I tell you in my first period of theological study my dissertation was on sexuality, and in my second theology degree my dissertation was on evangelism. 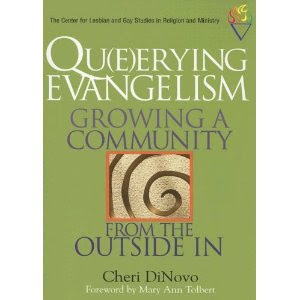 And now I'm starring at book that combines queer theology and theology of evangelism! That sounds like a pretty perfect book to me. There was no way I wasn't going to buy that book. My reading habits being what they are, I've only just finished reading the book. And it's worth sharing some thoughts I've had as I read it. I assume the book is based on a PhD thesis, and it kind of reads like it is, sometimes to its detriment. Some parts (like the biblical surveys) feel like the kind of things you have to do to get good marks in academic study, that don't necessarily translate well into a published book. But overall I still found it readable and enjoyable. The book is written by the Minister of a United Church of Canada Church in Toronto, and tells the story of how that church became "queer." The church began an evening service that not only attracted gay people, but also trans people, prostitutes, homeless, and drug-addicts. DiNovo asks the question of how the experience of trans people in particular (perhaps the queerest of the queer) challenge the theology and practice of evangelism. The author is not herself trans, and presumably hetereosexual, and I would have liked to have seen some exploration of whether a "straight" can do "queer" theology. I'm not giving an answer to that question, but I think it would have been worth exploring it. The book very much shares the theology of Bryan Stone's book in that it criticises most church growth literature for failing to give priority to the marginalised as a distinctive feature of Christian evangelism. Phrases like "cruciform evangelism" (28) sound very reminiscent of Bryan Stone. If you like Stone, you'll like this. I was very taken by the assertion that Christianity has only spread in three ways: colonialism, monasticism and martyrdom (21). I particularly struggled with the very neo-orthodox/Barthian/Calvinistic/Augustinian theology that pervades the book. There is a whole of a lot of "we're all in sin" (even though this is used to say none of us should judge) and "Christ died for all of us" and "it's impossble for us to do good works." As a Unitarian, it's the kind of language that I just can't get my head around, even when it's married successfully with postmodern philosophy. But there are a lot of things I did like about the book, a lot of the things I would have liked to have seen in Stone's book. DiNovo, like Stone, asserts that evangelism should primarily be judged by its faithfulness, rather than it's "success" in attracting new people and producing church growth. But she also makes the point of saying that being a small church is equally not necessarily a sign of faithfulness (174). The other theme that she really develops is that evangelism is a two-way process. This is very much my theology of evangelism, so I was glad to see it. The church offers a gift to the outsider, but also the outsider offers something to the church. She makes the point again and again that the queers that came to the church evangelised the church as much as the other way around. It was the queers who were prophets and evangelists, transforming/evangelising the church (163). What is by far the most inspiring part of the book is the real life story of one church trying to live out an inclusive gospel. How are you inclusive to both drug addicts and families? Are we prepared to have a trans prostitute serve communion? How are we inclusive to conservatives too? This are real struggles that this church faced. The book offers no easy answers, but shares the story of struggle. It also shares the stories of those queers who became part of the church, their difficulties, their tragedies, and the ministry of evangelism they offered. No easy answers, but real lives. Overall I'm left with the impression of a church with a truly Christ-like ministry, and a sense of regret that more churches aren't like that. "The more we understand each other intimately, the more queer (different, unusual, abnormal) we seem to be. A church that allows us to be as queer as we feel, feels welcoming to queers (those that exist on the margins). This is a high-demand church in the areas of Christian formation because difference is difficult... Church must humble itself to welcome the queerest of the queer." Thanks for this Stephen. "If you like Stone, you'll like this." Guess what I'm going to do now. Hi Stephen :) I love this book too! It has it's moments of course, but overall, it's a more faithful vision and witness of what church can and should be. Also, Bryan has been using this book in his Evangelism class for a few years now. Hi Xochitl. That makes sense, I'd hope one would be aware of the other.